Smartphone user base has grown exponentially in recent years across the globe. The more these mobile devices are getting advanced, the more is the challenge to keep them in a good shape. Sometimes, our simple mistakes prove fatal reducing the life of our smartphone. With some simple yet effective tricks, we can make sure that our smartphone goes a long way and remain in a good condition. All these tips are quite easy to follow and ensure you can get more out of your smartphone with everyday usage. All you need is regular housekeeping of your smartphone's storage and few simple precautions. This way, not only it will function properly, but its life will increase by many folds. These tips are most effective when you make them your habit. A one-time application can bring your smartphone back to the old condition where it is vulnerable to wear and tear. 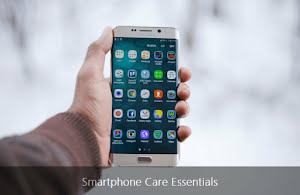 So, let's once go through these simple yet extremely useful tips to make our smartphones work like a new one without any hiccups even after years of continuous usage. Whether you're using an Android phone or an iOS-powered phone, the suggestions mentioned below more or less applies to both the platforms. Let's get started. With an explosion of just about every kind of smartphone apps under the sun, users are often tempted to try them every now and then. This leads to the creation of a pile of unnecessary apps ready to consume your phone's vital resources. Some of these apps are poorly coded and may put an unnecessary burden on your phone's processing power, may gobble up large storage space, and may consume a large chunk of RAM. In fact, some of these apps may steal sensitive information from your smartphone. There are primarily two types of unnecessary apps one must keep away from the phone. The first category is the collection of pre-installed apps which comes bundled with a new phone. Do a manual audit of these apps and uninstall the ones which are not necessary at all. The second category is of the apps you're tempted to try just out of curiosity or fun. Resist this addictive temptation to ensure you do not inadvertently install bloatware or malware infected apps. While installing an app, use trusted sources to ensure you do not fall victim to an infected application. Android users should install apps from Google Play Store and iOS users should grab the apps from the App Store. Avoid cracked and unsigned apps fetched from untrusted sources. In a nutshell, before installing an app, ask yourself if it is really vital for giving it a place in your daily routine. This way, you can easily cut down on the—number of apps—installed on your smartphone. Quite naturally, this advice applies to almost every software platform. In this context, these updates fall into two categories. Updates related to phone's operating system (Android or iOS) and the updates for all the applications installed on your smartphone. System updates are critical to the security and stability of your phone. Whether it's a major release or a minor (patch or hotfix) release, one must download and apply them—without any delay. The same rule applies to app updates. Apart from regular updates, sometimes developers preemptively push an urgent update to counter an emerging security threat for a specific platform. One must keep a sharp eye on these critical updates and must apply them—without any fail—to avoid any catastrophe. One of the primary reasons a smartphone gets hacked or infected is the owner's negligence when it comes to applying software updates to his mobile device. Bottom line is, never ever overlook or delay your phone's software updates and apply them as soon as possible. A good percentage of smartphone users actively install and use an antivirus system on their desktops and laptops. But when it comes to the phone's security, the need for an antivirus app is totally ignored. The timely software updates alone cannot guarantee the security of your smartphone. An antivirus system is one of the important apps one must install while configuring a new smartphone. If you're using an antivirus app, make sure the automated updates of virus definitions are not disabled. I'll strongly suggest going for a premium version of the same. Licensed copies are given preference when it comes to pushing virus definition updates. Having no issues to date doesn't imply your smartphone is immune to malicious applications. If you're still not using or are reluctant to use an antivirus app, look no further and install one—right now. You can compare your smartphone's home screen with your computer's desktop. Who likes a desktop bombarded with countless application shortcuts creating confusion for the user? It same question applies to phone's home screen as well. A comparatively smaller screen space cluttered with widgets and app shortcuts not only affects the performance but also deteriorates user experience. If you're already using a limited number of apps, the probability of cluttering your phone's home screen is quite low. Shortcuts for the apps you're using—throughout the day—are perfect candidates for a home screen. Complement your decluttered home screen space with an equally simple wallpaper. Though not necessary, one can also use an app launcher system to get complete control over home screen customization. Remember, less is more when it comes to customizing a phone's home screen. When you buy a new smartphone, you get a customized UI experience which may feel nice and good, initially. If you're using a low or mid-range phone, tweaking various UI settings can significantly improve its performance in terms of speed and resource usage. Various UI effects like animations, shadows, 3D effects, and sliding effects consume both memory and processing power. One should disable these fancy UI effects for better performance. If you do not want to disable all the UI effects, leave all of them except animations which consume most resources. A good app launcher can be considered (by technically challenged) to quickly and easily customize various UI and UX effects. Most slide notifications can also be disabled unless you really can't live without them. These UI tweaking settings are more targeted towards handsets with inferior hardware specifications. If you're using a low budget smartphone, try these tweaks to boost its responsiveness. Nowadays a lot of smartphone apps silently run in the background eating up the phone's system resources. The way these background apps put an unnecessary burden on the phone depends on what exactly they're doing silently—without your knowledge. Some of these apps consume your bandwidth while other keep the storage device busy performing various kinds of information syncing activities. Again, if you own a phone with a limited amount of RAM, these background apps can give you a sluggish user experience. To cope with this, first of all, disable always-on internet connectivity. 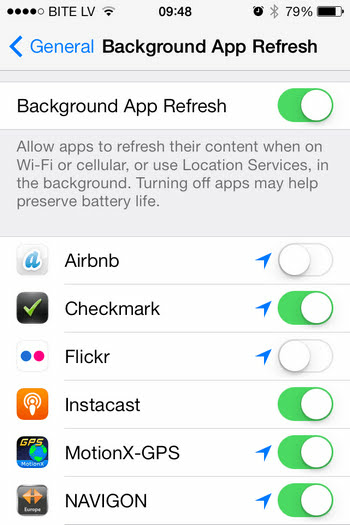 It'll help in curbing the remote syncing activities of background apps. Thereafter, you can selectively disable (as shown above) apps which you think are running unnecessarily in the background. But—do make sure—you do not inadvertently disable absolutely vital background apps necessary to run important features and functions. Once done, you'll notice more RAM available for foreground apps. There are two types of cached data stored on a smartphone. The first one is a system-wide cache and the second one is the application-specific cache. This cached data continuously gobble up your phone's storage. Some apps store huge amount of cached data. If you have a limited amount of storage space and you never clean cache, sooner or later you're going to run out of it. Modern gaming apps, maps, and media streaming apps generate a large amount of cache. Make it your habit to regularly delete cache on your phone. Cache for apps generating a large amount of data should be cleared almost on a daily basis. And for other apps, a weekly schedule is good enough. The system-wide cache can be cleared every fortnight or on a monthly basis. If you find it cumbersome to manually clean cache for all the apps, use a cache cleaner system to speed up the process by many folds. It'll keep your phone fast and responsive without sacrificing storage space. Generally, smartphones are designed to run continuously without any need to reboot the device. Then why we're advising to reboot it every one or two weeks? Has it anything to do with your phone's health? When running for a long time, a pile of hidden inaccessible cache, a few hidden or stalled background processes can slow down your phone and can make it sluggish. This problem can aggravate if the phone is not rebooted for a very long time. The simple solution to this problem is to reboot your phone once in a while. After a reboot, a lot of generally inaccessible system cache is automatically purged and all app processes (foreground, background, & stalled) are terminated too. This frees up the phone's vital resources. The reboot process just takes a couple of minutes and can be done easily. Even if you own a high-end phone with ample system resources, a reboot is still recommended for the reasons explained above. Here we're not talking about cleaning cache and freeing up RAM. The physical cleaning of the phone's exterior is equally important as well. Unfortunately, a good number of us pay little attention to this. Most high-end phones are waterproof, but what about dust resistance and other environmental factors? If not cleaned properly, sooner or later, it may start giving problems. This holds true if you are living in an extremely humid and damp environment for a long time. To clean the phone's exterior, one can use cotton swabs, microfiber cloth, and small cleaning brushes. Avoid use of water and complete the cleaning process—with a gentle hand. If you find it too dusty and are unable to clean it properly at home, do not hesitate in getting it serviced from the nearest service center. It's not just about cleaning lint and dust from the phone but it's also about keeping your phone look like a new one. Though it is not directly related to phone's health, I've included it to make sure your phone not only remains in top notch condition but can also be recovered, if it gets stolen. Unfortunately, a lot of savvy smartphone users never care about installing an anti-theft system. Installing one gives you a peace of mind and increases the probability of finding your lost phone by many folds. It becomes more necessary if you're commuting through public transport on a daily basis. The two best anti-theft systems I can recommend are Google's Find My Device and Prey. Both these options are reliable and trustworthy and have a huge user base. Once installed, they can track the location of the phone which can be remotely locked and its data can be remotely erased too. One can also remotely capture the culprit's photo and can get it silently emailed to you. Though Prey has a free plan, I'll highly recommend its premium version. Let's finish this comprehensive guide with a few more tips and tricks to ensure your smartphone lasts, really long. Following these tips will further prolong the life of your mobile device. So, without wasting any more time, let's go through these smartphone care guidelines. Do not use defragging apps for your phone's flash storage. It can shorten the life of your storage space. Advanced users can use custom ROMs devoid of any preinstalled bloatware. Stay away from RAM booster and speed booster apps. The advice given in this guide is good enough to take care of these issues. Invest in a good smartphone stand. It'll protect your phone from accidental dents and scratches. And last but not the least, resist the temptation to be glued with your smartphone throughout the day. It may negatively affect your health in the long term.